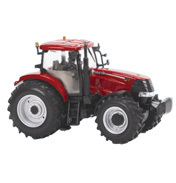 As you probably already know, Britains is a very popular brand name in the making of Tractor models and toys. 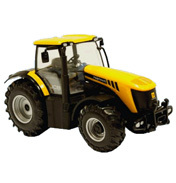 All of their products are made to very high standards and have been since 1948, when they released their first model of a Ford E27N (Tractor). 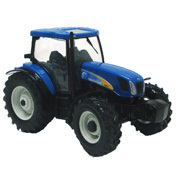 In 1998 the Britains Company transferred to China, where the production of Britains Tractors still carries on, still with the same high quality as it had before. 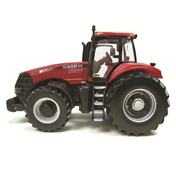 The Britains Farmyard Toys range includes tractors from Case, John Deere, Massey Ferguson and JCB. 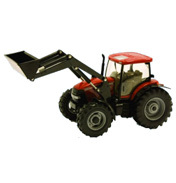 The word tractor is taking from a Latin word, trahere, meaning to pull. It is a general term for a vehicle used for delivering high effort at a slow speed for the moving of trailers or other machinery used for agricultural or construction purposes. Henry Ford, an American engineer and inventor, introduced the Fordson in 1917. It became the first tractor to be mass-produced. 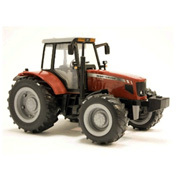 The design of a tractor is basically a vehicle with two driving wheels at the back, behind a single seat. The engine compartment is in front of the driver with two steerable wheels underneath. 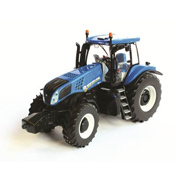 This design has been largely unchanged throughout the years of tractor manufacture but on most of the modern models you will see an enclosed cab has been added which is primarily for the comfort and safety of the driver. Some tractors are built with caterpillar tracks, which means that a continuous band is propelled around two or more wheels allowing for the vehicle’s weight to be distributed over a larger surface area. This enables the vehicle to travel over soft ground with the increased likelihood that it will not sink and get stuck. These types of tracks are seen more commonly on tanks and excavators but if your farm has particularly soft ground you might need a tractor with caterpillar tracks.